Defining “Nora” is a little bit like nailing jello to a tree: slippery, frustrating and inefficient. However, today we persist! Regardless of whether you describe the Far-Northside Indianapolis location (generally considered to be contained within Meridian Street on the west, Castleton on the east, Ravenswood to the south, and the Hamilton County line to the north) as a city, suburb, community, neighborhood, hamlet, town, village (or if you’re like me and you just call it… HOME) here’s what I can tell you for sure: At this writing, Nora is 141 years old. 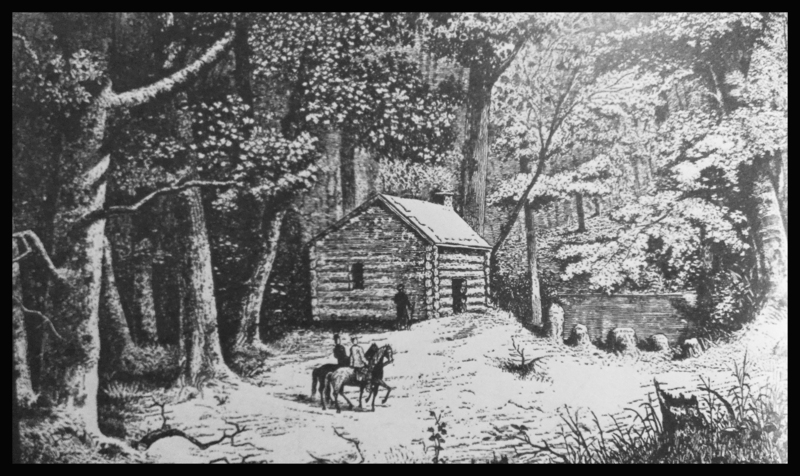 Before Nora was “Nora,” though, the somewhat swampy and heavily-forested area was home to native Americans largely from the Delaware (or Lenape) tribe who farmed and hunted abundant wildlife along the White River and tributary creeks. As these native peoples were forced from the area, the forests were leveled gradually and replaced with farms. An entry from the 1882-83 Polk Gazetteer. Image: Tom Keesling. In the early 1800s, parts of the general area were called Sutton’s Corner or Buck Town. However, on January 4, 1872 a charter (a copy of which is rumored to be located in the Nora Library) establishing a post office at 86th Street and Westfield Road was granted to one Peter Lawson, a Swedish immigrant living in the area. The charter clearly reads that Lawson would be the postmaster of the new office at Nora. Besides the post office, the area boasted a general store, grocery, blacksmith, two-room schoolhouse, saw mill, churches and feed mill on land originally granted to an Abraham Bowen. None of the original structures remain. Even the origin of the name “Nora” excites some uncertainty among historians. 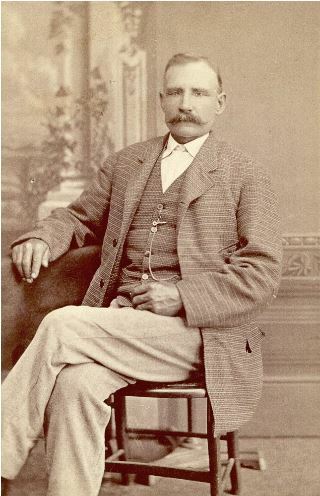 Certain publications report the area was named for the daughter of an early Monon railroad contractor, John B. Greene, who was hired to build passenger stations. The timeline doesn’t support that notion since the Monon Railroad arrived in 1883, well after the charter was established. Some historians have claimed Peter Lawson named the area after his own wife (though that can’t be accurate since Lawson family letters reveal he was married twice, and never to a “Nora”). However, Lawson had emigrated from Nora Parish in Sweden and for that reason, historians often credit the name to Lawson. An Interurban car. 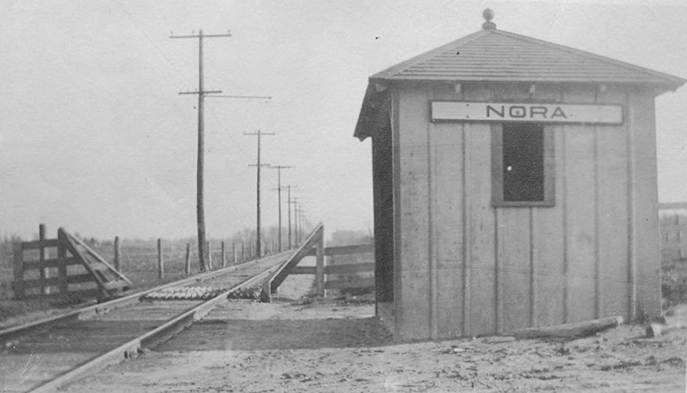 Nora was once a stop for both the railroad and Interurban lines. Click to enlarge. (Image: Collection of Tom Keesling, Hoosier Recollections). Though the railroad, and eventually the Interurban line, both made stops there, for generations Nora remained nothing more than a sleepy rural hamlet, not much more than a convergence of the important-but-unpaved roads: S.R. 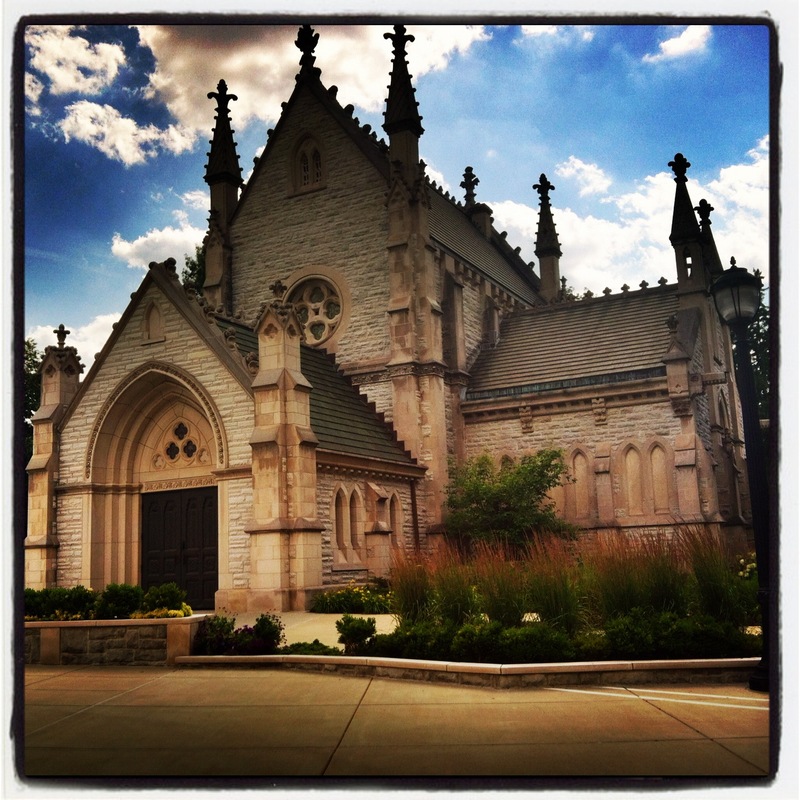 431 (Westfield Boulevard), U.S. 31 (Meridian Street) and S.R. 100 (86th Street). 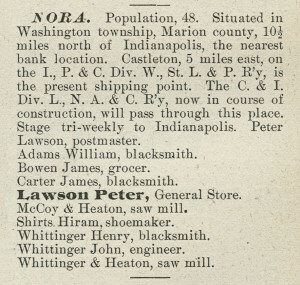 Then, as Indianapolis rapidly expanded in the 1950s post-war building boom, the Nora area succumbed, as well. 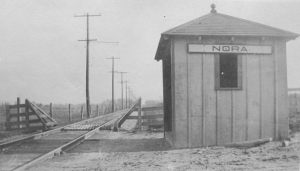 The Nora Interurban stop. Images of Nora-area buildings and families are rumored, rare and largely undiscovered in personal collections. 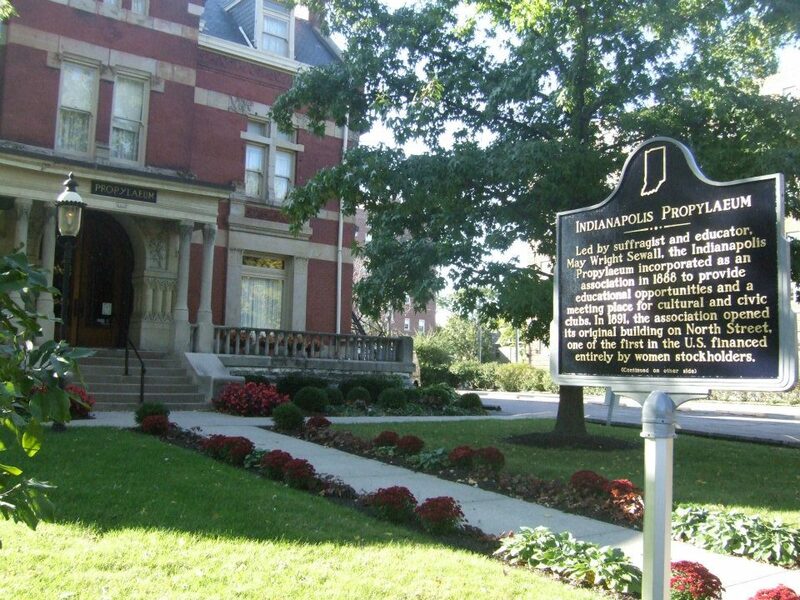 This photo was discovered on the Facebook page of an Indianapolis history group and used with permission. Hopefully, as Facebook’s “graph search” and hashtagging (#) becomes more prevalent, content will become searchable and therefore easier to access. 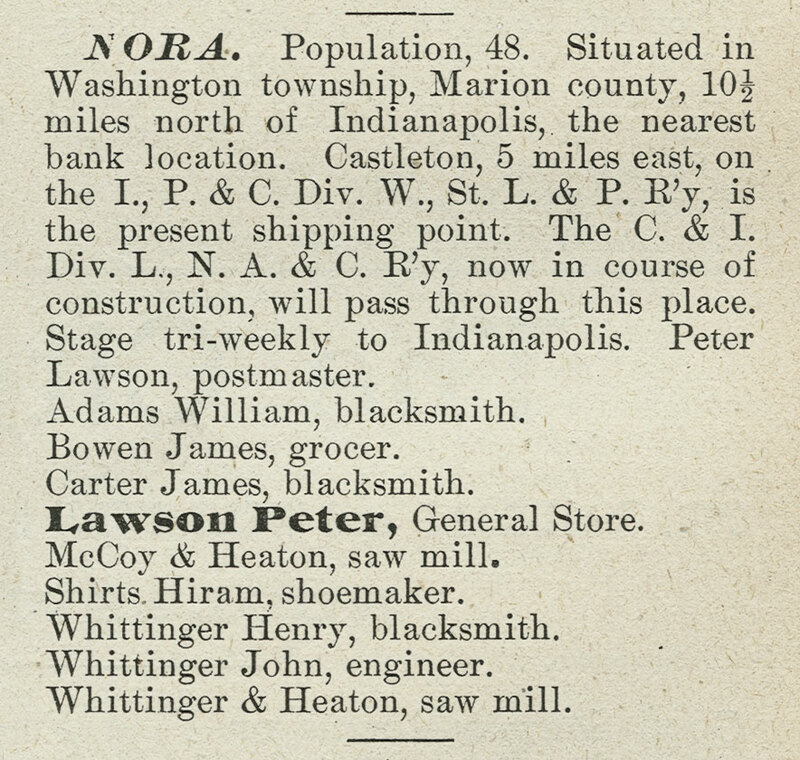 Though it’s been part of the greater Indianapolis metropolitan area since city and county governments consolidated in 1971, Nora doesn’t have firm boundaries because it was never incorporated. 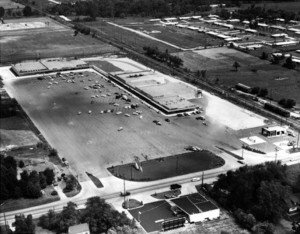 Nora Plaza circa 1960 – while the Nora area was still largely rural. Tell us: what are your memories of Nora? Treasure troves of Nora ephemera are fabled to exist in private collections of neighbors and friends but scant photographic material can be found in the usual library repositories. If you are the owner of such historical materials, please don’t leave them to molder in hidden shoe boxes! Share them with the area libraries and historical societies for generations to enjoy… and with us here! 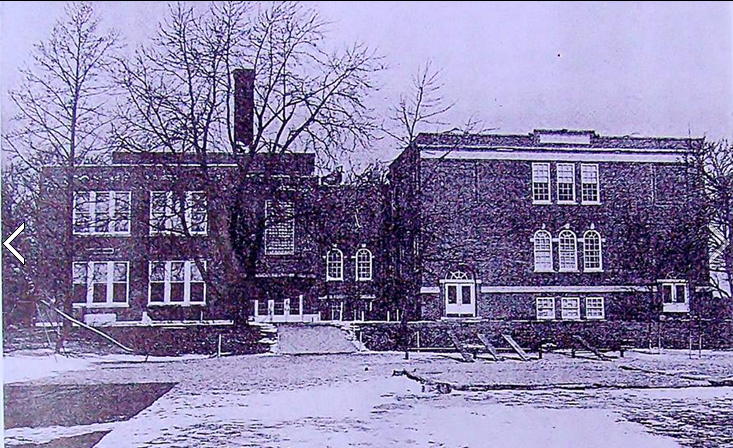 The old Nora Elementary School stood in the area of 86th Street and Westfield Boulevard near what is now North Central High School. Circa 1958. Image: Mike Boyer. Special thanks to Tom Keesling of Hoosier Recollections and Sue Zobbe of the Sherwood Forest Neighborhood Association in… Nora. Friday Favorite: Which Came First, the McCormick or the Pogue? Whoa! 86th street was a constructed road, not just an old road paved over. Highway 31 was certainly paved in the 1940’s. Westfield Blvd. was outside my territory in the 1940’s, but it was paved by 1952. These dates apparently seem incredibly far in the past, but both horses and buggies were obsolete in Nora by 1945! So, the next question is how many of you, in addition to the undersigned, ever rode the ABC Bus lines which had service from Muncie to Indy via Noblesville? The ABC bus would pull up to the drug store on the southwest corner of Road 100 and Allisonville [86th St.] and even if no one wanted to get off or get on, the driver would usually go into the drug store in case there was luggage or a package to drop off or pick up. I think that service was still running in 1952 when I graduated from Muncie Central H.S., but I suspect it was either gone or on its last legs in 1956 when I graduated from DePauw Univ. Norm, I do not remember the name of the bus line, but I worked with my aunt at a nursing home on North Capital, just north of Methodist Hospital in the mid 70’s. I could catch a bus there that would go north and then east on SR 32 towards Anderson. I could get off about half a mile from my aunts home. You paid the bus driver for your trip, but I do not remember the amount. Wish we still had it today. From one Nora citizen to another, thanks for this piece. Enjoyed it! The Nora entry from the 1882-83 R. L. Polk gazetteer mentions a pair of railroads. The “W., St. L. & P. R’y” was the Wabash, St. Louis and Pacific Railway. It was in operation and ran through Castleton that was the nearest shipping point for Nora businesses and residents. This railway company later became part of the larger Wabash Railroad system and ultimately part of the Norfolk Southern Railway. 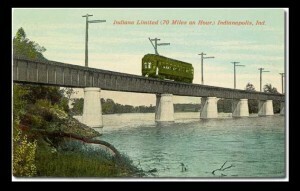 The “I., P. & C. Div.” was the abbreviation for the Indianapolis, Peru and Chicago Division of the Wabash Railroad. Passengers could travel from Indianapolis to Chicago via Castleton, Noblesville, Tipton, Kokomo, Peru, etc. The “L., N. A. & C. R’y” was a reference to the Louisville, New Albany and Chicago Railroad. This, of course, was the Monon Route. The 1882-83 gazetteer also includes full-page advertisements for these two railroads, among others. Also, to clarify, the post office would have been located in the Lawson general store. I am the new manager of the Chateau de Pique Winery tasting room and store in Castleton. 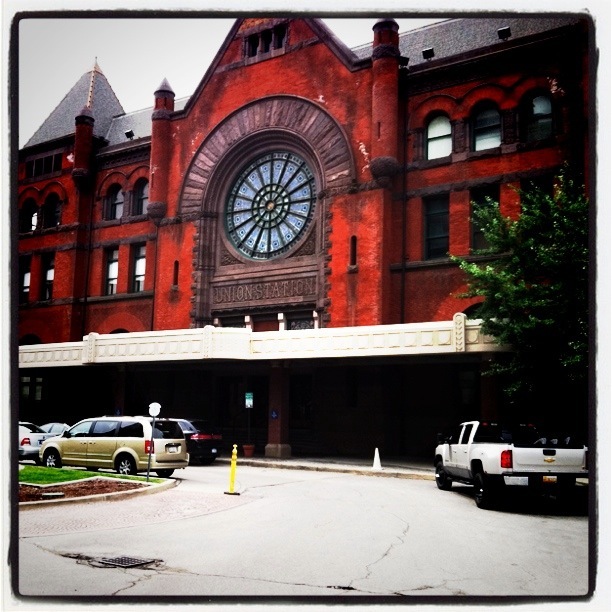 We are located in the old Castleton train depot. As a lover of history, I am very eager to get some more information about the depot, history, the railroad, etc… I would love more to display and share with our guests. I have a little bit of info, but you seem to be knowledgeable! I would love it if you would contact me! 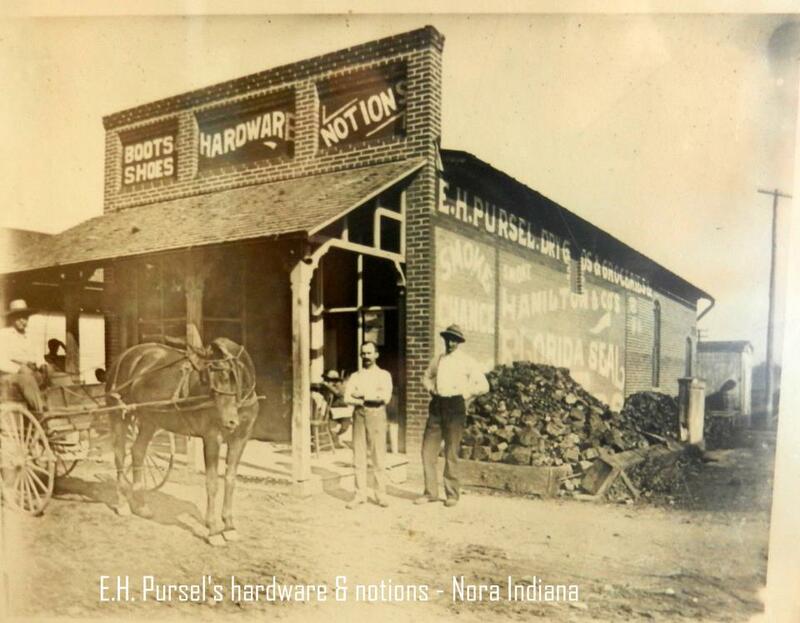 As a Boone County farm girl growing up in the 1960s I loved pretending that Nora was my town. Since there were no other Noras my age and never a chance of finding my name on a pencil or bicycle license plate this was the next best thing. Our pediatrician was in Nora (1010 E. 86th Street) and any prescriptions were filled at Nora Apothecary. My little book reading heart was most delighted by the fact that there was a library with my name on it and I loved mailing letters from the Nora post office and I’m proud to say that I still frequent both of them. I was recently in the Nora Kroger, still wearing my Second Helpings name tag when the deli clerk ran out from behind the counter and welcomed me to “my” store. Thanks for the history and I still feel a sense of pride whenever I’m in Nora. Was your pediatrician’s name Dr. Lawson. If so he was mine and my daughter’s. I grew up at the corner of 86th and ElRico. We had three acres. The house faced 86th. My father built a second story on it. Neighbors didn’t like it. I’m so happy I found this website. I live in Nora now and can remember the area form the early 1950’s. Family members lived on College Ave. near Holly Hock Hills. The memories Travel through a majority of my life. I remember taking our loved family dog to the vet’s office near or at Dean Road. The area was full of gravel pits. the roads so narrow. the area was so far from home… North Central High school was at about 83rd and Westfiield Bld., what is Northview Miiddle School. How great to visit these Years gone by. 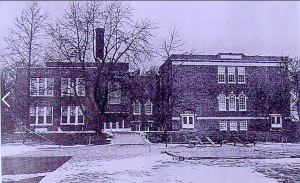 Kudos to Lisa Lorentz for putting this all together and to Mike Boyer for the picture of the old Nora Elementary School where I spent seven great years. No I didn’t get held back, they had kindergarten in an adjacent building. I grew up near 79th and Westfield. A great place to grow up with many wonderful memories. Many thanks again for putting this together. Just wondering if anyone remembers a Tee Pee Restaurant back in the ’60s located where the fuel station for Kroger is now located. I don’t, but I have a friend who swears there was one there. Can someone help us end this debate? Thank you in advance. My parents had a home built in Nora in ’58, before Nora Plaza was built. My how it’s all changed. Remember the Rexall Drugs where the Steak and Shake is and the little strip mall with the barber shop between it and the McDonalds (now Jimmy Johns)? The Old A&P? Who didn’t get their shoes from Goodman’s? I don’t remember it, but there was a Tee Pee in Nora from 1964 to 1968. It opened in what had been “The Nora Cafe”, and after the Tee Pee closed, it became “Curt’s Restaurant”. Curt’s sat there closed next to the Monon tracks for many years before it was finally demolished. I was born in Nora in 1958. I remember Nora Plaza Burger Chef Sparkle Plenty laundromat all kinds of places. I lived at the northwest corner of 86th and ElRico Road. My grandfather built all the homes on ElRico and Manderley. My mother named Manderley.